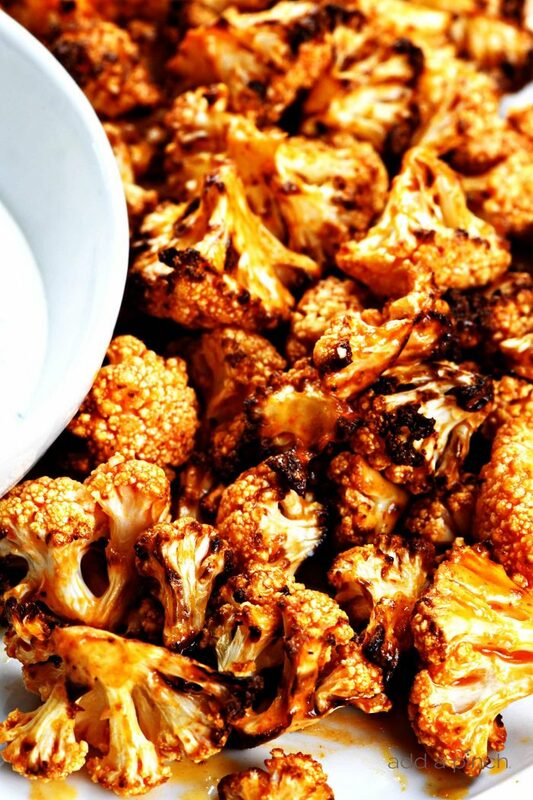 Air Fryer Buffalo Cauliflower Recipe – Liven up your cauliflower with this healthy, delicious buffalo cauliflower recipe made in the air fryer! Ready in minutes and always a hit! Need a simple recipe that makes a delicious appetizer or snack that everyone will love? These buffalo cauliflower are just the trick! Over the years, I’ve received so many emails on my buffalo wings or buffalo chicken dip asking if there was a vegan or vegetarian option. And now that low carb is all the rage with so many of our friends, this buffalo cauliflower makes that appetizer that checks off all the boxes – simple, spicy, and sensational! 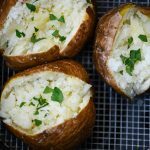 And while this recipe is written for an air fryer, if you don’t have one, don’t worry! I’ve also included the directions for making in your oven as well! I decided rather than loading this recipe with so many unnecessary ingredients, I would keep it as simple and easy as possible! And friends, two ingredients are really ALL you need for these delicious buffalo cauliflower bites! There’s no need for all of the spices, flour, cornstarch, etc, etc, etc. All you need is a head of cauliflower and buffalo sauce. That’s it! For the cauliflower, I like to start with a large head of cauliflower that it then cut into florets. If you’d like to skip that step, you can of course begin with a bag of cauliflower that has already been cut into florets for you. You can find these in the produce section of your grocery store. I’ve tested with frozen and thawed cauliflower florets and while it tasted delicious, the florets were way too small for my liking. You’ll also use buffalo sauce. 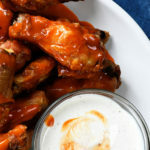 I prefer to use my easy as can be homemade buffalo sauce recipe. It only takes a few minutes to make and tastes absolutely out of this world. 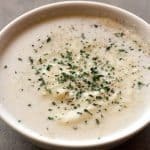 I like to make a large batch of it to keep on hand in the refrigerator to mix with a bit of ranch dressing for salads or to drizzle over chicken, etc. But, if you would rather, you can absolutely use your favorite bottled buffalo sauce from the grocery store. 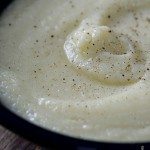 Once you have those two ingredients on hand, you simply add your cauliflower florets to a large bowl and pour in half a cup of buffalo sauce. Gently toss the cauliflower to coat it well with the buffalo sauce. Meanwhile, you’ll preheat your air fryer to 360º F. This generally takes about 2 minutes. Once it has preheated, spray your air fryer pan with cooking spray. 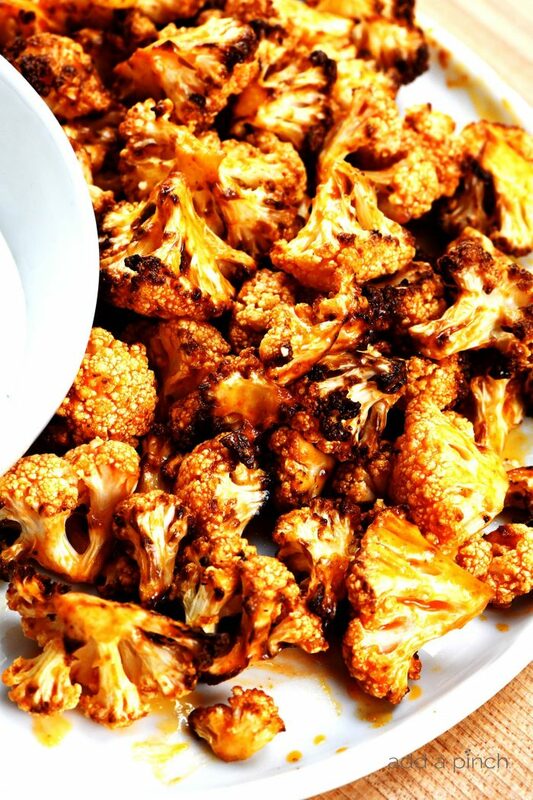 Arrange the coated cauliflower onto the pan of your air fryer. Air fry your buffalo cauliflower for 12 – 15 minutes, making sure to shake the pan every 5 minutes. I like for my buffalo cauliflower to have crispy edges, so I generally go for the 15 minutes! If you do not like crispy edges, adjust the time to your preferences, somewhere around 12 minutes. If you do not have an air fryer or prefer to prepare your buffalo cauliflower in the oven, simply preheat your oven to 450º F. Spray a rimmed baking sheet with cooking spray. 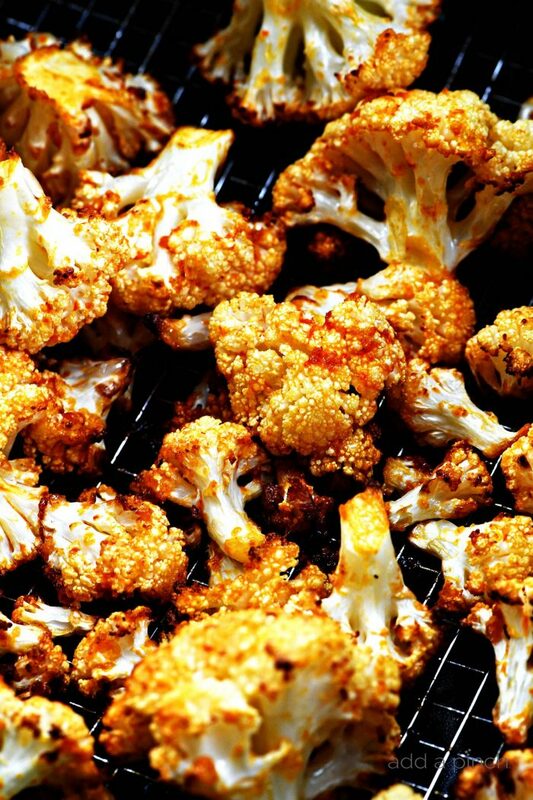 Arrange the coated cauliflower in a single layer on the baking sheet and bake for 20 minutes. Remove the cauliflower from the oven and toss with additional buffalo sauce. Return to the oven for 5 more minutes. Once the buffalo cauliflower has cooked to your desired amount of crispness, remove it from the air fryer and transfer to a serving platter. Serve with the remaining buffalo sauce and ranch or blue cheese dressing for dipping, if desired. Here’s my Buffalo Cauliflower Recipe. I hope you love it! 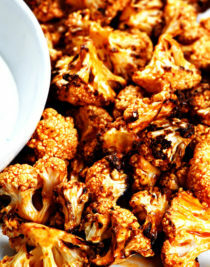 Air Fryer Buffalo Cauliflower Recipe - Liven up your cauliflower with this healthy, delicious buffalo cauliflower recipe made in the air fryer! Ready in minutes and always a hit! Preheat air fryer to 360º F. Spray air fryer insert or pan with cooking spray. Add cauliflower florets to a large bowl. Pour half of the buffalo sauce over the florets and toss to coat. Arrange the cauliflower florets on the prepared pan and air fry for 12-15 minutes, shaking every 5 minutes. Serve with the reserved buffalo sauce, ranch dressing and / blue cheese dressing, if desired. 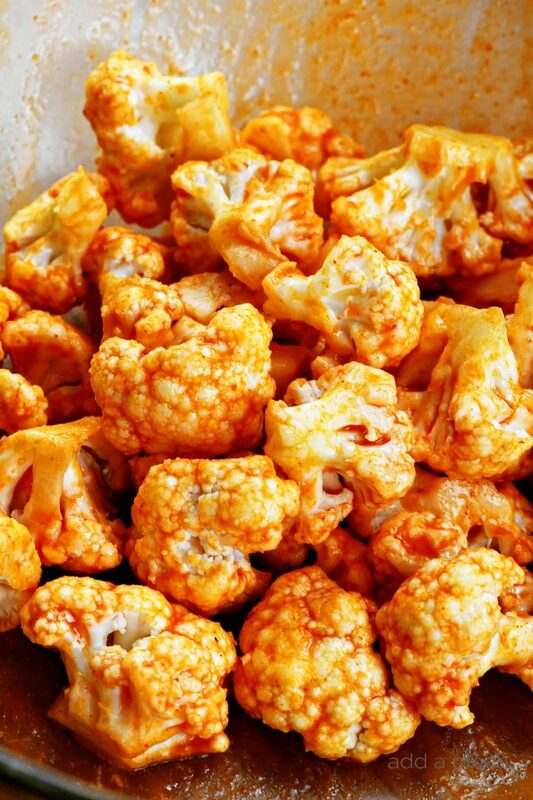 To make buffalo cauliflower in the oven, preheat oven to 450º F. Spray a rimmed baking sheet with cooking spray. Add cauliflower florets to a large bowl. Pour half of the buffalo sauce over the florets and toss to coat. 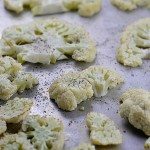 Arrange the coated cauliflower on prepared baking sheet and bake for 20 minutes. Add half of the reserved sauce and toss to coat. Bake an additional 5 minutes. In your detailed explanation you say to preheat airfryer to 400 degrees but in the recipes instructions you say 360 degrees. Which temperature is it? Thanks. 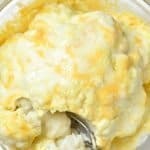 If I used a bag of frozen cauliflower could I cook it frozen or do I have to thaw it first? Hi Katlyn, I thawed the cauliflower first before using in this recipe. Thanks.